Though the sun was nowhere to be found yesterday, students of Saint Nicholas Primary School were beaming with excitement as they toured the aircraft of the Caribbean Skyway Air Rally at the V.C. Bird International Airport. 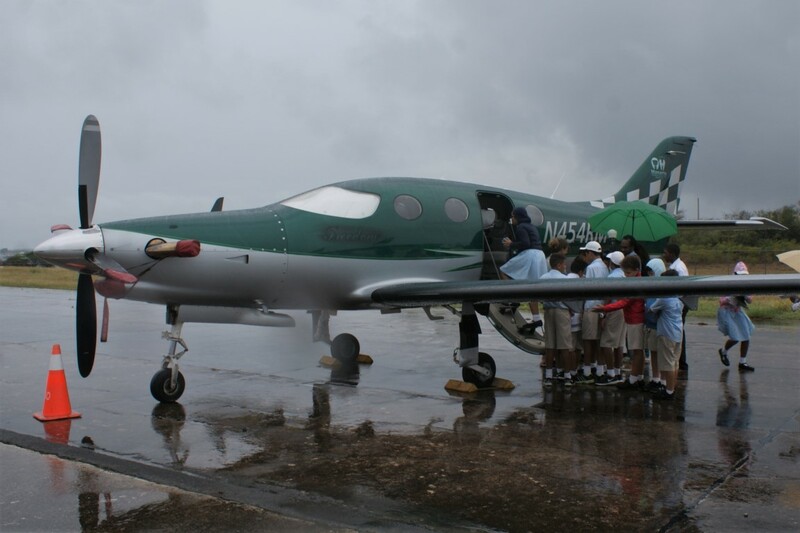 In an initiative sponsored by the Antigua Hotels & Tourist Association (AHTA), twenty-three Grade 6 pupils were given the VIP treatment as they were ushered onto Runway 10 to embark on a private tour of the visiting general aviation aircraft. “How often do these children get this close to a small plane? We are giving them that experience. It may very well inspire some of them to become pilots. The pilots are very excited to welcome them into their world,” AHTA General Manager, Neil Forrester said. And the pilots did not disappoint, giving the St Nicholas children a rare glimpse into the life of a recreational pilot. They were regaled with tales of adventure, danger and the inner workings of a small aircraft. This is just the excitement Air Rally Ambassador, Brian Pound, wants to inspire in the children they meet, not only in Antigua, but all of the countries they will visiting during their 13-day Caribbean rally. “The most important thing is it opens their minds to other possibilities and expands their horizons…Seeing kids eyes open wide as they ask interesting questions and learn something about aviation, that is interesting for me,” Pound said. The class trip is not purely recreational; their participation counts toward the student’s social studies curriculum. Thus far, the 34 aircraft of the Caribbean Skyway Air Rally fleet has visited Grand Turk, St Croix and Martinique. After leaving Antigua they venture on to Tortola and Haiti before disbanding to their ports of origin throughout the United States and Canada.